We have visited a couple hundred wineries over the years. Although there are always trees around the often sumptous architecture housing the tasting room, on a sunny day the parking lots are broiling asphalt deserts. 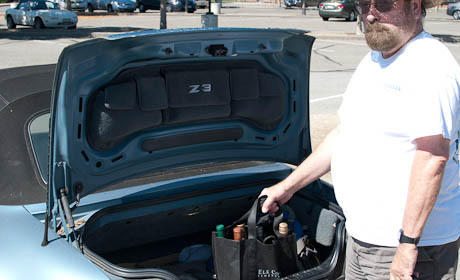 Think of the typical wayfarer… after visiting a few wineries, he or she probably has some wine purchases in the car. 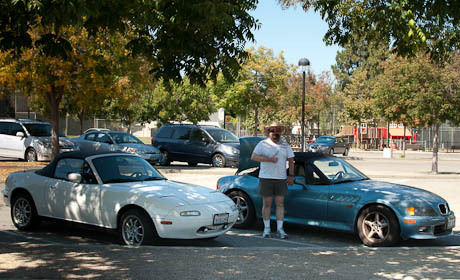 Parking in the hot sun in your parking lot will damage most of this precious cargo. And the wayfarer may like your wine and buy a bottle or a case. At the next stop, your lovely wine gets cooked along with the wayfarer’s previous purchases. When the wayfarer opens your bottles in a few weeks or months and takes a taste – Ugh! Not the way the wayfarer remembered it. No customer delight, no brand loyalty. 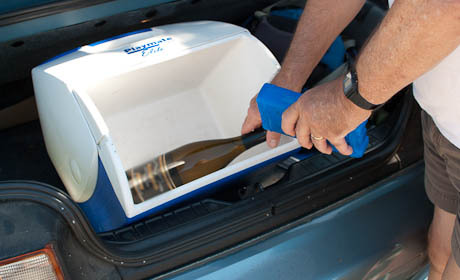 Give us gas-guzzling winery visitors some shade where we need it! Most wineries have trees Sadly, the parking lot is often placed in such a way that the shade falls outside the lot — often on the grapevines. This is not ideal. Wineries – please consult with your arborist to select trees appropriate to your climate, able to thrive near pavement and without droppings harmful to car finishes. Even if wineries took this advice and started modifying their parking lots tomorrow, it would probably take at least 10 years for those trees to produce shade. So when you plan a winery tasting roadtrip, get prepared. Take an empty cooler and some well-frozen reusable blue ice packs. Real H2O ice will damage your labels as it melts. You could slip each bottle into a plastic vegetable bag for added protection. Plastic Igloos work fine for a day. We are thinking of upgrading to a metal Coleman or even a Yeti for future multi-day trips. Cabelas, the purveyors of gear to hunters, fishesr, campers, sells them at its store in Springfield, OR and also online.